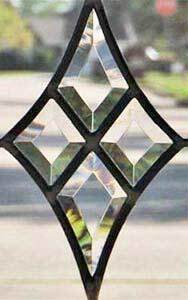 5CH76V Leaded Glass Beveled Sidelight Window Custom Glass Design. "5CH76V" VERTICAL SIDELIGHT LEADED GLASS WINDOW CUSTOM AT GLASS BY DESIGN. Leaded glass vertical bevel sidelight window was handcrafted by Jack McCoy© in association with Glass by Design. This leaded glass sidelight window was 14" x 76" and had five CH76 bevel sets, the first and fifth were clear, the second, third, and fourth were gluechip bevel sets. The background glass was clear textured Rough Rolled with a clear Waterglass border. The only color in this window is what the camera saw through these clear textured glasses.